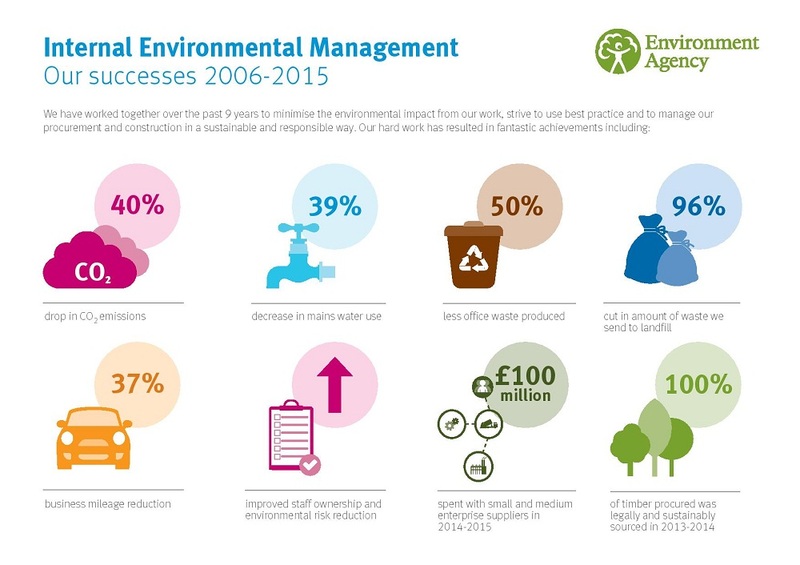 Over the last decade we have successfully delivered environmental improvements across the Environment Agency which helped us to both reduce costs and negative environmental impacts. Savings achieved by reducing the Environment Agency’s carbon footprint include slashing £1.5 million from our offices’ energy bills since 2006/07. Here, Simon Dawes explains how this was achieved by innovating, challenging and creating a culture of environmental excellence. I have always had a passion for the environment both in my personal and professional life. I am in the fortunate position to head up the Internal Environmental Management (IEM) Team and our responsibilities include reducing the organisation's negative environmental impact. Our work has delivered both cost reductions and environmental improvements for the organisation. We have made some significant improvements over the last decade. The most significant one being our 40% reduction in CO2 emissions (against a target of 33%). This equates to a saving of 23,000 thousand tones which is the same as 1,805 average homes would produce in just one year! The IEM team has overseen the delivery of eighty new carbon cutting projects from simple solar-powered hot water systems through to more complex bio-mass heating for our laboratory. All of these projects and others have helped us to beat our target. 100 million cups of tea? We’ve made some other significant reductions as well in both water and waste. Adding rain-water harvesting systems and other innovative water-saving technology to our offices has helped to cut our water use by more than a third (39%). This has saved 24,463m3 of water each year since 2006 – enough water to make 100 million cups of tea. Since 2008, we have reduced the amount of office waste we produce by 50%, equivalent to 7,400 household wheelie bins (375 tonnes). In addition we have reduced the amount of waste reaching landfill (96% reduction over 8 years) annually to less than the weight of a bag of sugar (1kg) per full-time employee and all of our food waste is used to generate energy. By wasting less paper and encouraging more digital work, we have cut paper use by 115 tonnes – saving nearly 2,000 trees each year. Also in our construction activities we have diverted over 1 million tonnes of construction waste from landfill and ensured that all of the timber procured by us was legally and sustainably sourced. Our hard work over the last 9 years to reduce our own impact on the environment has also seen us come top of the pile when it comes to being a green public sector organisation. We recently beat off competition from other Government departments to clinch the 'most sustainable public sector organisation in government' award, handed out by the Public Sector Sustainability Association (PSSA) to add to the list of awards we've won over the last few years. We are developing our plans for the next 5 years to help us to further reduce our environmental impact. One exciting opportunity we are currently working on is to increase the number of electric vehicle charging points and using ultra-low emission vehicles which emit less than 50g of carbon dioxide per kilometre. We will also be working with our suppliers to ensure they continue to reduce their environmental impacts – such as carbon, water and waste – on work they complete for us.